That's a missed opportunity for brands, and a waste of the marketing dollar it took to get people to download the app in the first place. The new mobile app features are intended to keep people using the app and drive them into action, i.e make a purchase or booking. And they do that by taking users directly to the action, rather than say, a brand home page (see the details here and see the developer page here). Facebook calls that "deep linking" and by increasing the amount of activity within Facebook apps, it makes it easier for brands to promote a specific deal. If Facebook can prove to brands that people are engaging, purchasing and converting in app ads, it's a pretty powerful proposition that sees it moving further and deeper into direct response. It means the platform is cutting out other links in the path to purchase, and therefore can justify claims for a larger share of brand marketing dollars. As Facebook detailed its app push, another of its developer partners Kenshoo Social announced a new demand-driven service which it claimed allows advertisers to better target Facebook ads by pulling in data from paid search, product listing ads and marketers own internal data. The company is setting up shop in Australia and recently told AdNews that Facebook was bringing global technology companies to the region as it steps up local activity. Meanwhile Facebook has also expanded Graph Search to let users (an initial trial group) search for status updates. According to this CNET article, the move is another step towards the "inevitable" launch of Facebook advertising in search. 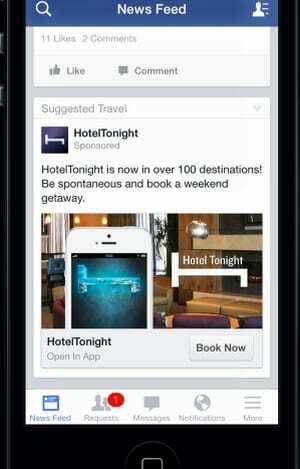 Facebook is gearing up for more mobile advertising revenue. This week it stepped up preparatory work for search ads and has also backed apps as a way to boost ad dollars without annoying users with advertising overkill. The app aspect is about driving people to actually use the apps they have downloaded and short-cutting the conversion journey: nudging people to act in the shortest time possible and reducing the steps in the path to purchase. It looks like Facebook is moving further and deeper into direct response. Most businesses are happy to shout about how many times their app has been downloaded. But they are less inclined to disclose how many people actually use it regularly. That's probably because two thirds of app users only open apps between 1 and 10 times, according to research by a company called Localytics, one of Facebook's partner companies.